"Studii şi Cercetări Ştiinţifice. 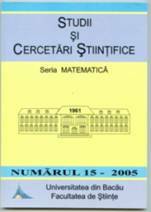 Seria Matematică" is published by the Department of Mathematics and Informatics, Faculty of Sciences, University of Bacău, Romania. Since 1990 one issue is published each year. "Studii şi Cercetări Ştiinţifice. Seria Matematică" publishes original research papers and surveys from all fields of pure and applied mathematics. "Studii şi Cercetări Ştiinţifice. Seria Matematică" is reviewed in Zentrallblatt für Mathematik and Mathematical Reviews. It is recognized by CNCSIS, Ministry of Education and Research of Romania, in category B+. Editors of "Studii şi Cercetări Ştiinţifice. Seria Matematică" are willing to exchange journal with universities libraries and research institutes. Persons interested to establish such an exchange are invited to contact us.